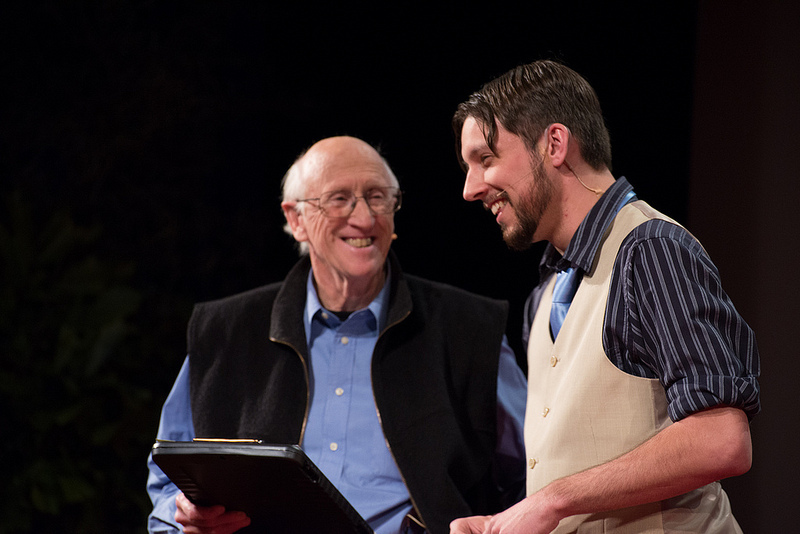 Stewart Brand (left) with Ben Novak, the scientist working on reviving the passenger pigeon. From promoting the publication of NASA’s first satellite images of the whole Earth to co-founding The Long Now Foundation, Stewart Brand has always sought to simultaneously humble and empower. Our planet, seen for the first time against the vastness of space, suddenly seemed finite and precious. Our society’s moment placed within The Long Now – the history and future of civilization – becomes tenuous and ephemeral. But, given this expanded awareness and “access to tools,” the biosphere and society’s lasting legacy are ours to sustain and cultivate. It is difficult to give a cursory list of the projects that Stewart Brand has instigated over the years. Some of his notable accomplishments include founding the “Whole Earth Catalog”, starting the Hackers Conference, co-founding the first online community (The WELL), and co-founding The Long Now Foundation. 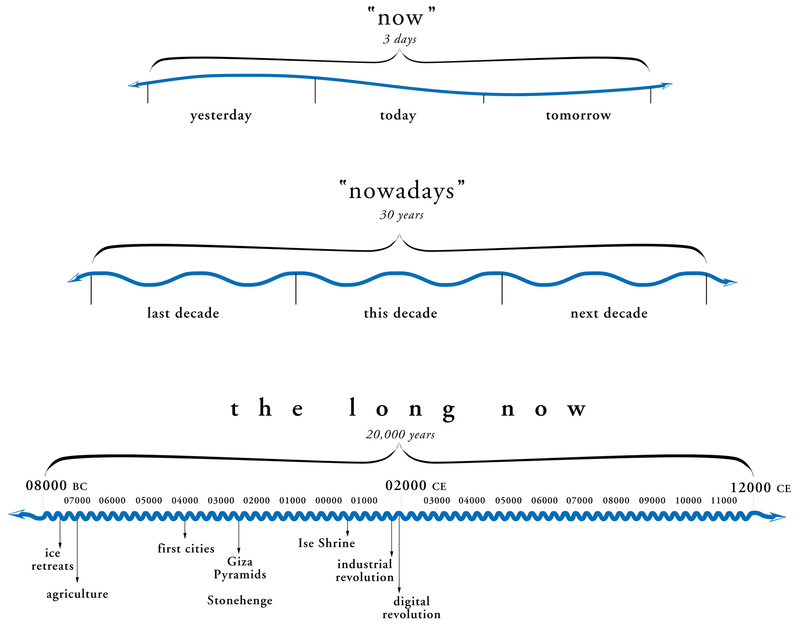 On top of all of this, he has found the time to write several books, including: The Clock of the Long Now, How Buildings Learn, The Media Lab, and Whole Earth Discipline. In this talk, Stewart Brand will discuss his newest project, Revive & Restore, which is seeking to de-extinct species with the help of genetic technologies. Over the past two years, Brand has been busy convening meetings that brought together the leading scholars working on the science of de-exintction, which culminated in March’s TEDx DeExtinction conference. Through these conferences, Stewart Brand and Ryan Phelan have mapped a set of questions to determine whether a species should be brought back from de-exinction. The common ground for the top candidate species are that humans were partially (if not largely) responsible for making them going extinct, and that these species were keystone species, or species that somehow played an integral and mutually beneficial role in the ecosystems they called home. In this sense, Revive and Restore is a natural complement to conservation movements that seek to rehabilitate ecosystems that have declined with the rise of the anthropocene. One of the first direct de-extinction efforts of Revive & Restore (a project of The Long Now Foundation) is to bring back the passenger pigeon. This iconic bird numbered in the billions in the 19th century, only to have the last specimen die in captivity in 01914. Revive & Restore has hired Ben Novak, a self-proclaimed passenger pigeon fanatic, to sequence the genome of the passenger pigeon and its closing living relative, the band-tailed pigeon. With the help of a loose consortium of genetic scientists, Stewart hopes that the passenger pigeon will successfully be brought back and re-wilded in America, allowing it to revitalize the forest it once called home. Although the genetic technology behind Revive & Restore is moving quite fast, the process of re-wilding will take generations–one of the reasons that the project is under the auspices of The Long Now Foundation. For example – since Woolly Mammoths take about 20 years to reach sexual maturity, even after scientists clone an individual (which may itself take many years), it would still be hundreds of years before re-wilded herds roam the tundra. Come join us at the new SFJAZZ Center on May 21st to learn about de-extinction from the front lines of this new science. You can reserve tickets, get directions, and sign up for the podcast on the Seminar page. If you are a member, please check your email for special ticketing instructions.